Available FREE to all full members. A link to download the 'House Sitting Guide' can be found on your 'How to' page in your Mindahome members control panel. 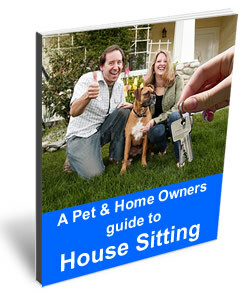 Originally written as a 'how to' for pet and home owners who are considering engaging the services of house sitters, this extensive guide is also an invaluable tool for house sitters, whether they are new or experienced. The guide, which includes a sample house sitting agreement between owners and sitters, covers all aspects of the house sitting concept so that even the smallest things are not overlooked. Outlining the expectations of both the home owner and house sitter, the book also covers home insurance, bonds, use of vehicles, a contract or house sitting agreement and information about pets that need to be cared for as part of a house sitting assignment. However, that’s just the beginning. The book also explains how to "choose a house sitter that's right for you" as well as how to check their credentials.